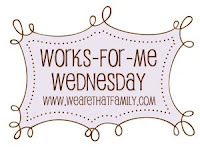 Stop and Smell the Chocolates: Works-For-Me-Wednesday: Stop The Summer Boredom! Works-For-Me-Wednesday: Stop The Summer Boredom! Today's edition of Works-For-Me-Wednesday is the "Mom I'm Bored" one, just in time for summer vacation! We're sharing the things that work for us in the summer to stop the boredom. ~ Free Movie Days: Regal Cinemas have free movies on Tuesdays and Wednesdays at participating movie theaters through the summer. You can check here for the listing. One of our local libraries also offers free movies one afternoon a week and the neighborhood programs have free movies in the parks one night each month. Be sure to check out your city to see what's happening! ~ Park Days: A couple of friends and I put together a listing of dates and specific parks in the areas for our Christian school. School families can join us every Wednesday in the summer at the parks we've selected. It's easy because everybody remembers the day & time and it's a nice way to get together with school friends. ~ Summer Reading List: Our library offers incentives in the summer for reading books, but we make up our own. My son helps me make a listing of how many pages to read and what small rewards he earns at different levels. This helps keep him on track reading through the summer. ~ Learn a New Skill: Learning something new can be exciting, so this summer I will start teaching my son to play the piano. Is there a new skill your kids could learn? How to play a musical instrument? How to cook? How to mow the lawn? ~ Fun Stuff: I just thought of this - we experienced theme days in VBS long ago. Why not have theme days at home? You could try "Wacky Hair Day" and give a reward for wackiest, like getting their lunch first. Or maybe "Backwards Day". Don't tell the kids ahead of time - surprise them when they wake up by telling them the theme for the day. Try it once a month, once a week, or more. Those are a few of our ideas. Hope you find something that will help you out! Have a fantastic Wednesday! Stop over at We Are THAT Family to get lots of great ideas to combat summer boredom! Wonderful ideas my friend. We plan on taking advantage of the free movies this year now that the youngest can sit through one. Big I would so win for wackiest hair size hugs to you. Those are all great ideas....It brought back some fond memories for me when my kids were young and I was a stay at home, homeschooling mom. We enjoyed many of those ideas. When my youngest started to kindergarten I realized that I had been a regular at our local library's pre-school story time for 7 or 8 years. I had withdrawals!! These are very practical tips! I especially like the "learn a new skill" one. I wish we had regal cinemas around here! Wow, I wish we had free movie days around here!